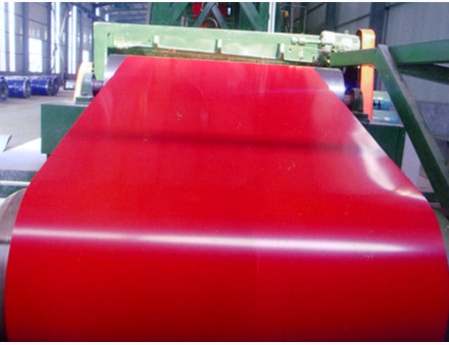 In a continuous unit in cold-rolled steel strip, galvanized steel (Electro galvanized and hot Galvanized) as substrate, after surface pretreatment (degreasing and chemical treatment), method for roll coating, coated with a layer or layers of liquid paint, after baking and cooling the sheet is coated steel plate.Because the coating can have a variety of different colors, the habit of the coated steel plate is called the color coated steel plate. Also because the coating is carried out before the steel plate forming process, which is called the pre-painted galvanized steel. Coating steel plate has the advantages of light weight, beautiful appearance and good corrosion resistance, and can be processed directly, which provide a new type of raw material for construction industry, shipbuilding industry, vehicle manufacturing, furniture industry, electrical industry provides a new raw material, played with steel instead of wood construction, energy saving, high efficiency, good effects of preventing pollution. Color coated steel based on galvanized steel ,except zinc protection, organic coating on the zinc layer up covering the isolation effect, can prevent rusting steel, galvanized steel service life is longer, the coating steel plate galvanized steel long service life is 50%. Protective effect:To protect metal plate from rust, corrosion, to achieve a longer life time. Decorative effect:All kinds of color, all kinds of luster make color steel plate rich, beautiful appearance.